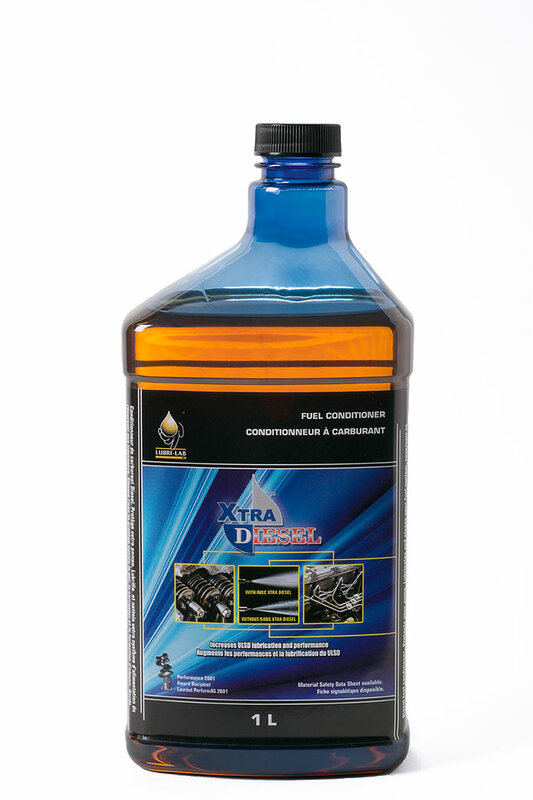 Xtra Diesel™ Fuel Conditioner improves the overall performance of Diesel fuel. It improves fuel economy by as much as 2.8% while cleaning the fuel system, eliminating deposits, algae and water. At a ratio of 1 Litre treating 1000 Litres (1 Qt. treats 250 gallons) if you maintain a 1.25% improvement in fuel consumption the product has paid for itself. With the recent changes to Diesel Fuel including the addition of Bio-Diesels and the reduction of sulfur resulting in Ultra Low Sulfur Diesel (ULSD), increased formation and growth of algae in fuel storage as well as significant reduction in the lubricating properties in the fuel have significantly increased operational challenges. Particularly, operators in all sectors are noting shorter injector and fuel pump life and clogged filters from bacteria growth. In some cases, fuel stored in any sort of damp or wet environments is becoming contaminated to the point of non-functional. Specific examples of this would include fuel stored for back-up generators in public works locations, ski resorts and aqua-agriculture sites.